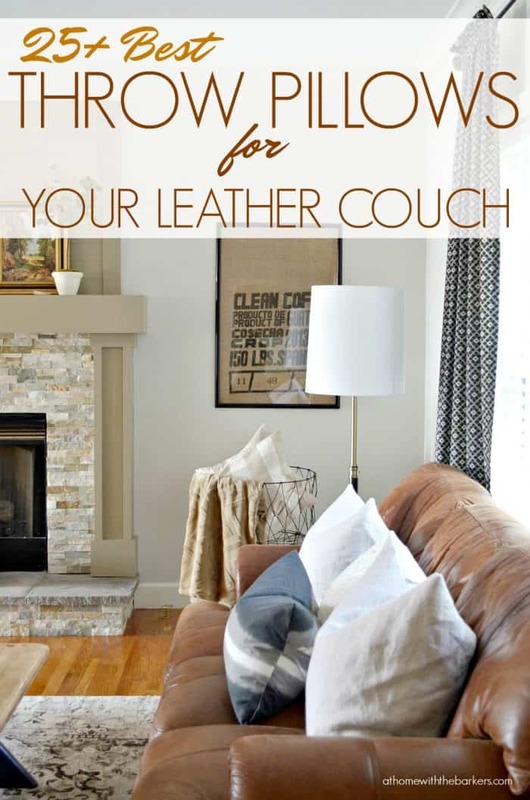 The best throw pillows for leather couch can make your space feel cozy and welcoming. Shop this post for the best collection for a brown leather couch. One of the things I love most in our home is our brown leather couch. Even with it’s chunky arms and worn cushions. Even when we completed our family room makeover I kept the couch. This couch is 17 years old. I get asked where it was purchased ever single time I share photos of it on Instagram. While mine is no longer made, I found a few here, here, and here that you can compare. Most people loved the chunkier look even though more streamlined looks are popular. As I always say, buy what you love! Side note, I did a poll on my Instagram stories asking what word was used more, couch or sofa. The results were 80% of my followers said couch. What do you say? The goal is to find a classic look that can carry you all year. These type of throw pillows are your base decorating look. They are meant to be built on. Look for solids that offer a contrast to your brown leather. White, beige, and cream always look amazing. Our leather couch is meant for lounging. The throw pillows must be comfortable to lay on. If you are buying pillow covers only be sure to purchase down filled pillow inserts. I grab mine here. Look for cotton, linen, and velvet fabrics for softness. Organic fabrics with tone on tone texture. Try contrasting colors like black and white or off white. Avoid silk and shiny fabrics because they tend to slide down. Down filled is a plus. Buy pillow covers for your seasonal changes. SHOPPING TIP #1: When you click over to any of the items be sure to add them to your cart so you can look around without forgetting what you came for. If you decide not to buy, you can remove it from your cart. I have found adding to my cart as I like something allows me to see all of my options together. Then I can omit if necessary. SHOPPING TIP#2: For people who still like to go to a store to shop, order your item online here but instead of shipping do local store pick up. Especially for places like Target. Many times I am in the store and end up ordering online anyway because the item I wanted is sold out. Hi! I’ve been having trouble with finding the right pillows for my beige leather sofa . I currently have blue velvet pillows but I don’t know if I should keep them or change them to blush off white or gray . HELP! What would you suggest for a beige leather sofa and it’s a sectional !